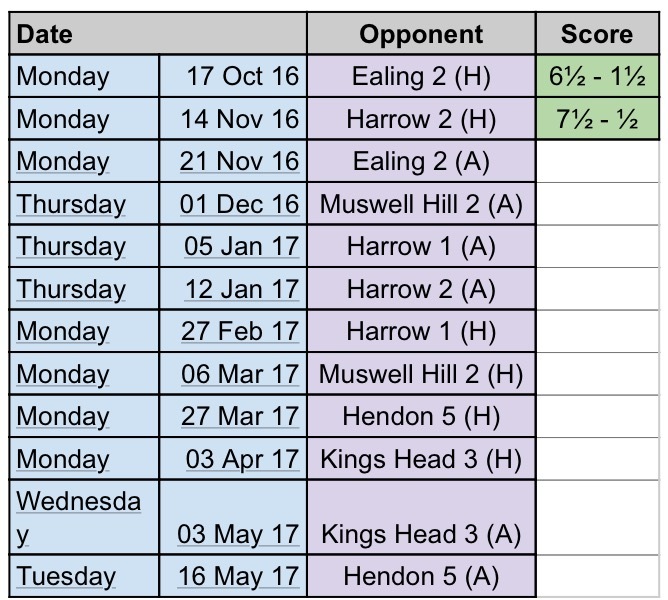 Middlesex League: A Harrow-ing Win! As the Christmas season approaches, the Middlesex League is into full flow. 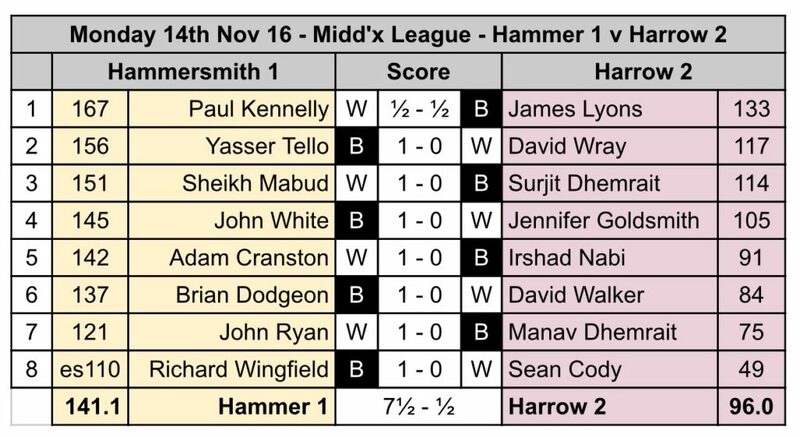 Coming off the back of their first 6½ – 1½ win, Hammersmith were full of confidence. The second match of the season saw the club play host to Harrow 2. Despite Hammersmith leaving out several of their top boards, this time the guests were outgraded by an average of 45 points! Boards 5, 7 and 8 were over within the hour, with Adam, John and Richard ruthlessly punishing a spattering of inaccurate moves by their opponents. On board 4 John had a dominating position against his opponent. Desperation took over, and she decided it was time to sacrifice a knight to get some play. Alas, it came to nothing, and John smoothly converted. Sheikh was next to finish. With all of the major pieces still on the board, his opponent decided it was high time to re position his king on f6, directly in front of the f7 pawn. Of course Sheikh’s attack came raining in immediately. Black resigned before the time control. Yasser looked in control throughout. Though only a pawn up for most of the game, he maintained the initiative and gradually forced his opponent’s pieces back onto the first rank. Finally the position collapsed and it was all over. Paul’s game on board 1 was the closest of the night. It didn’t take long for the entire queenside to become closed, and for play to be focused only down the f, g and h files. With the black king trapped for much of the game on h8, Paul’s opponent defended tenaciously against the relentless queen, rook and bishop batteries. As time trouble grew more intense, Paul missed perhaps his only chance on move 39, where cheeky push of the f pawn would have blown open the position and won him the game. Paul reluctantly accepted the draw offer 15 moves later. Brian Dodgeon has been labelled by some as the Magnus Carlsen of West London. Infamous for seeking out positions where he has a slight edge, opponents are gradually ground down by his accurate, if not always spectacular play. Today was no exception. After establishing an early passed pawn on the queenside, Brian was unphased by huge pressure down the open e-file. A series of drawn out piece shuffles commenced, and soon Brian’s opponent saw nothing better than to give up the pressure by exchanging pieces. After some more patient shuffling, it was time to start pushing the passed pawn. As it started to pick up speed, its promotion became inevitable and his opponent offered his hand. Previous Previous post: Tournaments, Simuls, and Chicken Biryani!